I’ve seen Piper’s future and her name is B. She’s our new babysitter. We met her at our church’s Peace Camp. I should have known then. Piper and Sissy dragged B over to me and announced that this was the young women they’d chosen for their new cargiver. I just do what I’m told, so B has spent the last few days at our house while I’ve been reacclimating to life in a suit. “What does she do if you and P are arguing?” I asked. Okay. The kids are happy. They’re safe. They’re running around the neighborhood enjoying the last moments of summer as kids should. The tv is off. B sounds dreamy, doesn’t she? She is. But that’s not even the best part. B has blue hair with streaks of hot pink. At the park and the pool the other kids call her “the girl with rainbow hair” as in “let’s go hang out with the girl with rainbow hair!” B has put some modern flare into her Mary Poppins drag. 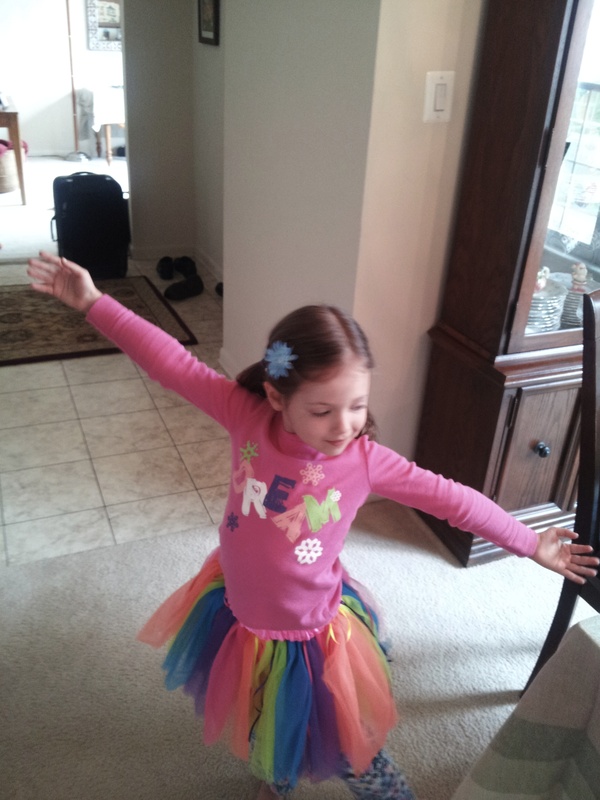 Yesterday B showed up wearing a rainbow tutu. It matched Piper’s exactly. By the look on Piper’s face, I thought Santa Claus himself was standing at our front door, but it was just B, in her rainbow tutu towering over P in her rainbow tutu. They’d planned the whole thing. In fact, B has a collection of tutus. She also has a Pinkilicious backpack. Apparently, all the high school backpacks weren’t stylish enough. How could they be? I’ve seen the woman Piper may grow up to be, and she’s just as awesome as I imagined. Better than that, she’s entirely herself. This entry was posted in Gratitude and tagged babysitters, dyed hair, Mary Poppins, modern day mary poppins, piperism, rainbow tutus by melissa.scholes.young. Bookmark the permalink. Hang onto her! She’s certainly the babysitter I never was. I second Emily’s comment. How the heck is B so cool? I thought I was such a good babysitter, too. It turns out I was a pre-parent, not a post-child. Le sigh. B is so cool. I know because my kids keep telling me. Over and over. They reassure me that I’m cool, too, but really I’m just the broccoli-good for them but no one chooses me. Le sigh indeed.